> Hefbruggen>Kolomshefbruggen>Modena symmetrische 2-palenhefbrug, hydraulisch met een mini-vloerplaat – 5T. Modena symmetrische 2-palenhefbrug, hydraulisch met een mini-vloerplaat – 5T. 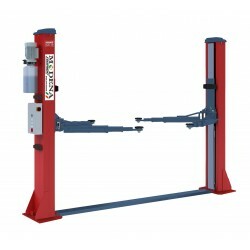 1900mm lifting height with standard truck adapter. Base plate design for low ceiling workshops. Only 45 seconds raising time with optional quick motor to shorten your service time. The four triple stage arms combination make the lift can accommodate wide range of vehicles from Smart to Sprinter. The power system switches off when vehicle roof touches the rubber protected overhead bar. Standard aluminum motor avoids overheating and ensures long service life.